All Oracle segments have an upper boundary containing the data within the segment. This upper boundary is called the "high water mark" or HWM. The high water mark is an indicator that marks blocks that are allocated to a segment, but are not used yet. This high water mark typically bumps up at 5 data blocks at a time. This post, I just needed to tested about determining HWM and reducing it by shrink space. Determining HWM, You can use *_tables for BLOCKS, EMPTY_BLOCKS - some information for high water mark. The DBMA_STATS didn't keep statistic about EMPTY_BLOCKS. 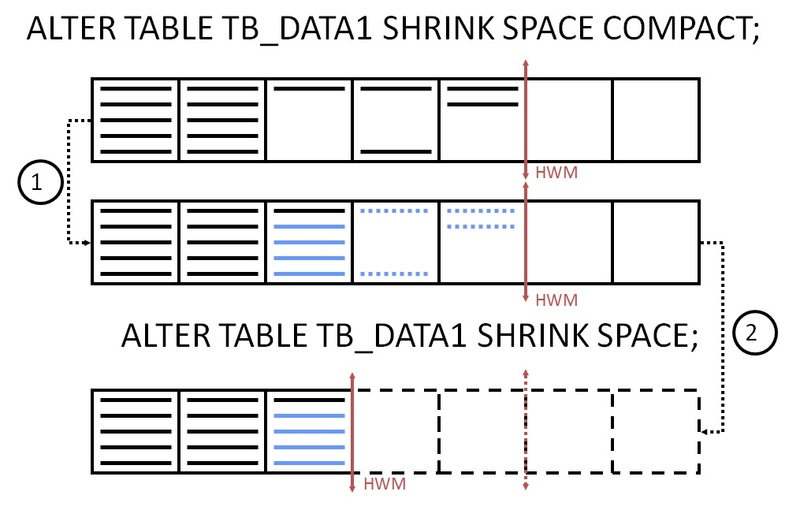 On 11g, You can compare table size with table actual size. Test Query with table, that has differ between table size and table actual size more than 250MB. 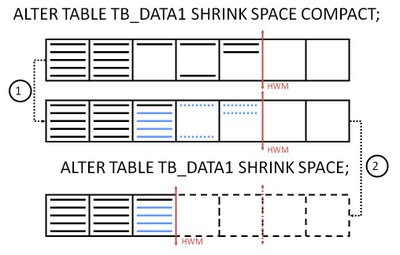 From picture "ALTER TABLE TB_DATA1 SHRINK SPACE COMPACT", that not reduce HWM... check it. After, HWM was reduced, query faster than and "Cost (%CPU)" value less than. then used dbms_stats.gather_table_stats procedure also. Shrinking helps to improve the performance of scan and DML operations on that segment. On Oracle Version 10.2, You know Automatic Segment Advisor. On 11g, You know Automated Segment Advisor. It's feature what is helpful for DBA. You don't need to determine HWM by yourself. You can retrieve information generated by the Segment Advisor. On "Oracle Database 11g Performance Tuning Recipes" book was also written about Automated Segment Advisor and showed SQL sample to retrieve information generated by the Segment Advisor.